As the birthplace of Christ, the charming town of Bethlehem has a sweeter meaning to Christians than any other place on earth. Its origins are lost in history. Being the birthplace of Christ has thrust this small, rose-colored city onto a world stage. Modern Bethlehem is a major tourist attraction with all the accompanying commercialism that this implies. Bethlehem’s real charm can be found in the side streets away from the center and pilgrim sites. The town and souq are a heady mix of ancient and modern, Muslim and Christian. When Joseph and Mary came to Bethlehem, they could not find room in the Inn and so Jesus was born in a cave that was used as a stable. Above the cave was built a magnificent church -The Basilica of the Nativity. The first Church was built in the first half of the fourth century A.D. by the Byzantine Emperor. The present church was built in 530 AD The entrance is low and narrow in order to protect it from invaders and prevent them from entering on horseback. Two sets of stairs on either side of the altar in the Church of the Nativity lead down into the Grotto, the site where Jesus was born. A fourteen pointed silver star embedded in white marble marks the exact spot with the inscription: Hic de Virgin Maria Jesus Christus natus est- Here Jesus Christ was born to the Virgin Mary. Of the fifteen lamps burning around the recess, six belong to the Greeks, 5 to the Armenians and four to the Latins. The Milk Grotto is an irregular Grotto hollowed out of a soft white rock. It is venerated by Christians and even by Muslims. Tradition has it that Mary stayed there for a short time with Jesus Christ when they were hiding from Herod’s soldiers. Some drops of her milk dropped, turning the rock white. The milk-white rock is famous for its healing powers for women who take a piece of the rock, grind it and mix it with their drink while nursing. A Franciscan Chapel surrounds the Grotto. It is situated on the Jerusalem-Hebron road just before the road forks right to Hebron, left to Bethlehem. The building marks the traditional Tomb of Rachel, Jacob’s wife. She died while she was giving birth to her son Benjamin. She was buried on the way to Ephrata, Bethlehem. Jacob built a memorial over her grave and it still marks Rachel’s Tomb today. The present sanctuary and mosque of Bilal were built during the Ottoman period. 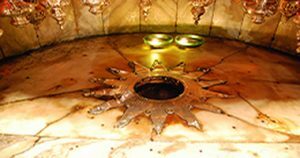 Biyar Daoud or David’s Wells are three great cisterns excavated in the rock to the northern part of Bethlehem. It is believed that the adjacent Church of St. David is where the King is buried. The cisterns were discovered in 1895. The church rested on a vast Necropolis composed of 18 Arcosolia with two to six tombs each. The cemetery was Christian as proved by the inscription. Shepherds’ Field is one of the most sacred places to Christians. According to tradition, the Angel appeared to the shepherds on this site and informed them of Jesus’ birth. The Roman Catholics and the Greek Orthodox each have their own Shepherds’ Field. 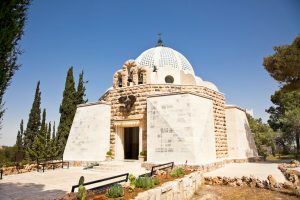 The Roman Catholic site features a Franciscan Chapel designed to resemble the shepherds’ tent, while the Greek Orthodox site features a 5th-century church built over a cave. The nearby field of Ruth is traditionally associated with the events of the Old Testament. The remains of the fortified palace Herod the Great built on a hilltop 6 km south-east of Bethlehem dominate the countryside and offers a view of the Dead Sea. A lavish and luxurious place in its day, a city of round walls and a fort enclosing apartments, baths, and a garden. The ruins of a large pool and extensive administrative buildings are at the foot of the hill. 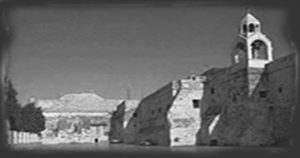 Three km south of Bethlehem, a turn off to the east leads to three large reservoirs and an Ottoman Fort. Partly excavated from rock and partly built, the huge reservoirs collected spring and rainwater and pumped it to Bethlehem and the AI-Haram AI-Sharief in Jerusalem. Today the water is used only by locals. The site is in process of being developed as an archaeological and national park. The Monastery stands like a fortress on a hill from which both Jerusalem and Bethlehem can be seen. It was founded in the 6th century AD and was rebuilt by the Emperor Manual Communes in 1160 AD Legend has it that the building stands on the site where Elias rested on his flight from the Vengeance of Jezebel. From the monastery, Bethlehem can be seen to the south, Herodion to the southeast and sometimes the Dead Sea across the valley to the east. St. Theodosius is about 12 km east of Bethlehem. This monastery was destroyed during the Persian invasion. The building that stands today was constructed by the Greek Orthodox Church and incorporates the remains of an old Crusader building and is inhabited by a dozen Greek Orthodox monks. A white-walled cave marks the place where the founder, St. Theodosius, is buried. 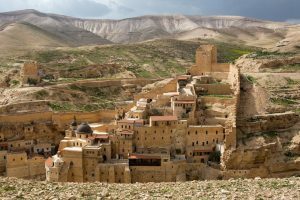 It is a further six kilometers from St. Theodosius to the Greek Orthodox monastery of Mar Saba. The immense and spectacular monastery, with its walls and towers, is a thrilling shock when it suddenly comes into view in the midst of this desert land. Built into the rock overlooking the Kidron Valley, Mar Saba represents a way of life unchanged since the time of Constantine. The monastery of Mar Saba is immense. It has 110 cells, although today it only houses ten monks. Although Mar Saba is reputed to have had a long tradition of hospitality to strangers, women have never been allowed to enter. This regulation persists today, so women visitors must be satisfied with a glimpse of the chapel and buildings from a nearby two-story tower, the so-called Women’s Tower.